For many patients whose kidneys have failed, a treatment option is a kidney transplant – when a kidney from one person is placed in the body of a person whose kidneys don’t work. Transplanted kidneys can come from either a person who has died (a deceased donor) or a person who is alive (a living donor). How can I get a transplant? In order to be a candidate for transplant, the patient must first be evaluated by a transplant center. Transplant is a major surgical procedure and may not be right for everyone. It is the responsibility of the transplant center to help determine the patient’s eligibility. Could I live longer with a transplant than I could on dialysis? Yes. Patients who have a transplant often live longer than patients who stay on dialysis. This is because dialysis is hard on your body and can cause other health problems. How will my life change if I get a transplant? After a transplant, you may feel better and have more energy to be with your family and friends, enjoy your hobbies, travel, and go back to work. You will also have more time, since you no longer have to spend hours on dialysis each week. Most patients who get a kidney transplant say it made their lives better and that they can eat and drink more freely. What should I do while I wait for a transplant? Eat what your doctor recommends. Take medicines your doctor gives you. Stay at a healthy weight (ask your doctor what weight is healthy for you). The healthier you are before a transplant, the better you’ll be after it. Who should not get a transplant? Transplant is a treatment, not a cure. This means that after transplant you will still need to make healthy choices, take medicine every day, go to medical appointments, and stay in contact with the transplant center. You will also need to rely on trusted friends and loved ones for support. If you aren’t willing or able to do this, you should not get a transplant. What types of transplants are there? Living donor kidney transplant: A surgery where doctors put a kidney from a living person into someone whose kidneys no longer work. Deceased donor kidney transplant: A surgery where doctors put a kidney from someone who has died into someone whose kidneys no longer work. A transplanted kidney can do the work of 2 working kidneys if it’s working well. How long does it take to get a transplant? A living donor transplant can happen within 1 year of finding a matching donor who is able to donate. For a deceased donor transplant, you will need to join the national waiting list. On average most patients in the United States wait 3–5 years on the deceased donor waiting list. Sometimes a matching kidney is never found. What are the different types of deceased donor kidneys? Low KDPI kidneys: These kidneys have a KDPI score between 0 and 20. They are from donors who were younger and healthier when they died. These kidneys last the longest. Standard criteria kidneys: These kidneys have a KDPI score between 20 and 85. They last 10–15 years on average. High KDPI kidneys: These kidneys have a high KDPI score (over 85). These kidneys last 7–10 years on average. 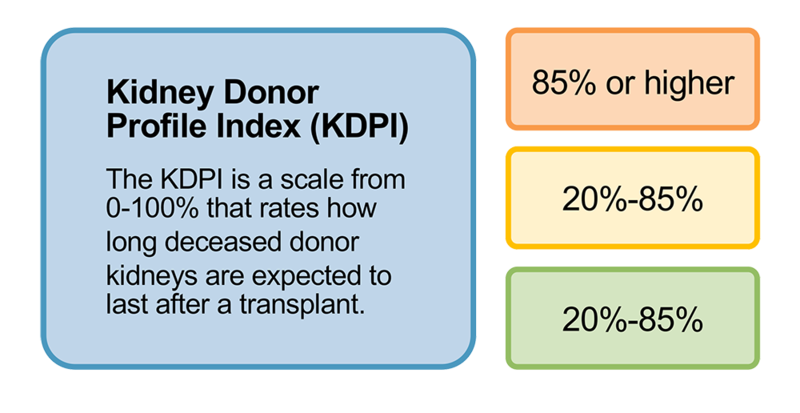 Kidneys that have higher KDPI scores come from deceased donors who were older or had certain health problems when they died. While these kidneys may not last as long, you may get a transplant sooner by accepting one. This may be a good option for certain patients, especially older patients who are expected to have longer waiting times. Unfortunately, there just aren’t enough low KDPI and standard criteria kidneys to go around. Patients expected to live the longest after transplant usually get these kidneys. If you are only willing to accept a low or standard criteria kidney, you may be on the wait list a long time. How long do transplanted kidneys work? Living donor transplants usually work for 15–20 years and deceased donor transplants usually work for 10–15 years. Living donor transplants often work longer than deceased donor transplants. How does the deceased donor waiting list work? National rules decide who gets a kidney from the waiting list first. The rules are based on factors like blood type, medical condition, where the patient lives, and how long the patient has been on dialysis and the waiting list. The rules don’t consider income, ethnicity, gender, or sexual orientation. Matching is based on factors like medical condition, where the patient lives, and how long the patient has been on dialysis and the waiting list. What is the waiting time for a deceased donor kidney? Waiting time is how long a patient has waited for a transplant. Waiting time is based on the day you started dialysis or if you are not on dialysis, the day you were placed on the waiting list. Each year doctors only transplant about 11,000 kidneys from donors who have died. This is because it’s rare for people to die in a way that allows their organs to be donated. This means there aren’t enough kidneys for the more than 95,000 people waiting. You may get a transplant. You may keep waiting until a matching kidney is available. You may never find a match. Your chance of getting a kidney increases over time. The longer you wait, the higher the chance you’ll get a transplant. Once listed, how can I stay on the waiting list? Once you are placed on the waiting list, you have to return to the transplant center for medical tests to stay on the list. You also have to let the transplant center know if your health, insurance, or contact information changes. You will need to follow the transplant center’s guidelines for eating healthy, taking medicine, avoiding smoking, and other healthy behaviors. You may be taken off the list or placed on hold if you don’t follow the transplant center’s directions or become too sick for a transplant. What is a PHS high risk kidney? Public health service (PHS) high risk kidneys are kidneys from a donor who may have done things before their death that put them at a higher risk of possibly getting and transmitting Hepatitis B or C, or HIV. Doctors screen all kidneys to check for infection before transplant, so the chance of getting an infection is very low — 0.033% (less than 3 in 10,000 people). There is a very small chance that the screening tests may not find an infection that began in the last few weeks before someone died. This is true for all donors. If found, doctors can treat these infections with medicines. PHS high risk kidneys may last just as long as a standard criteria kidney, generally 10–15 years. Many kidney patients don’t want to accept a PHS high risk kidney, so if you are willing to take one, you can get a kidney sooner. How can I learn more about kidney donation? You can learn more about the process of living kidney donation for both recipient and donor at Living donation and Basics of Living Donation. How might I get a kidney faster? You may have a shorter wait time if you’re willing to take a kidney with a higher KDPI score or PHS high risk kidney, meaning that it may not last as long or may have a low chance of carrying an infection. You need to tell the transplant center which types of kidneys you’re willing to accept. If you’re open to accepting all types of deceased donor kidneys, you have a better chance of getting a kidney transplant, and could even get one years sooner. As you choose what’s right for you, you’ll need to think about how long you’re willing to wait and the quality of the kidney you’re willing to accept. The more types of deceased donor kidneys you’re willing to take, the higher the chance you’ll get a transplant and the shorter your wait time might be. What is the waiting time for a living donor kidney? Generally, the wait for a kidney from a living donor is shorter than for one from a deceased donor, provided some outreach has been done. But there is no way to say for sure how long a wait for a kidney from a living donor could be. It depends on finding a match and many other individual factors.